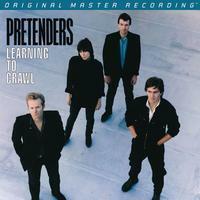 The Pretenders Learning to Crawl on Numbered Limited Edition Hybrid SACD from Mobile Fidelity! Vigorous determination and solemn reflectiveness pepper hits such as "Back on the Chain Gang," "2000 Miles," and "Middle Of The Road"
Mastered from the original master tapes, Learning to Crawl finally possesses the combination of whisper-in-your-ear intimacy and nerve-checking toughness that it's always demanded. Leader Chrissie Hynde's voice is made viscerally apparent, wavering between vigorous determination and solemn reflection, while drummer Martin Chamber's punchy backbeats register with requisite punch. To say nothing of how fresh the effort's hit singles ("Middle of the Road," "Back on the Chain Gang") and incredible deep cuts sound.